Let me start this review by saying that before this past year or so, I wasn’t overly fond of vodka. More accurately, I hated, feared, and avoided it at all costs. My first experience with this spirit was all-too-typical – I drank way, way, way too much of it when it was mixed with a terrible combination of other ingredients, which I will not mention here. This experience kept me far away from vodka for several years, until, as luck would have it, I found a job at Stone Ridge Wine & Spirits. Since then, vodka and I have reconciled. In the last year, I’ve tried quite a few vodkas, ranging from the classics, like Absolut, Ketel One, and Stolichnaya, to slightly more obscure brands like Tito’s, Sobieski, and Russian Standard, to the ultra-small-batch, boutique vodkas, like Tuthilltown Spirits‘ Indigenous, Harvest Spirits‘ Core, and the subject of today’s review, Industry City Distillery’s Industry Standard. I won’t go too much into this vodka’s background, since its creators did such a great job of detailing it on their beautifully designed website, but I will say that it is distilled in Brooklyn, New York from American-grown sugar beets. I’ve heard of vodka being made with wheat, rye, corn, potatoes, and even apples, but this is the first I’ve heard of sugar beet vodka, so for me, this was a must-try. As with pretty much any other vodka, Industry Standard is perfectly clear. A quick swirl coats the glass and produces slowly descending legs. Worth mentioning is the bottle, which looks like it should be used for lab chemicals rather than vodka. At first glance, this looked a bit like a warning label. 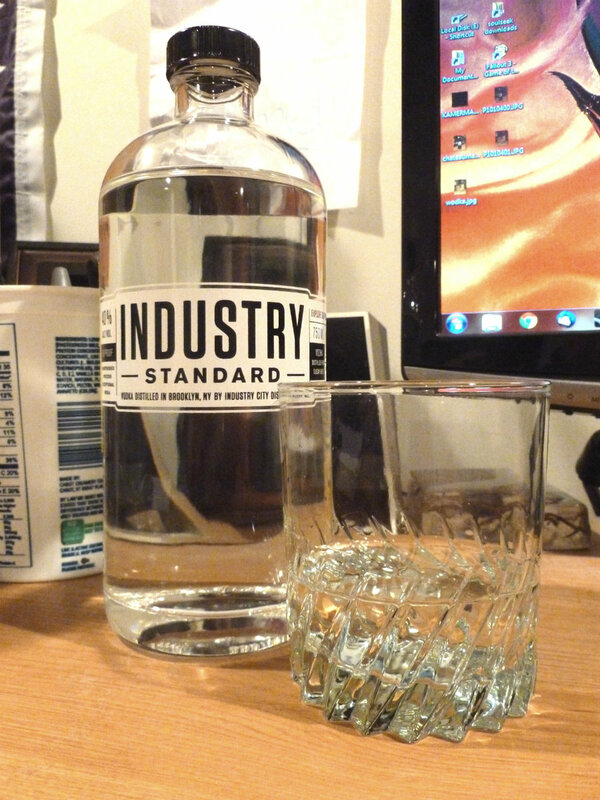 You have probably never had a vodka that smells like Industry Standard. This vodka exhibits a candy-like nose with hints of butterscotch and vanilla bean, with just enough of an alcohol burn on the finish to remind you of what you’re about to drink. The first sip is remarkably smooth – almost so smooth that you could mistake it for water, if not for the pepper that begins building on the tongue after a few seconds. Following the pepper are lasting notes of vanilla and fresh fennel, which finally give way to a clean, mineral finish. I find that a lot of different vodkas just taste like, well, vodka, and only for a second, and then they’re gone, almost as if you’d never taken a sip in the first place. This vodka’s viscosity allows for its flavors to hang on a bit longer than a lot of its peers, making it a perfect slow sipper. Our next installation of “let’s drink the things you’ve been scared of since college” will be a triple review of the Blanco, Reposado, and Añejo offerings from Arrogante Tequila.